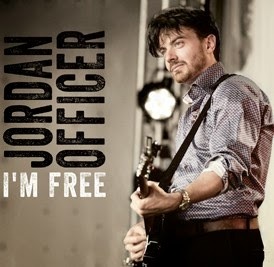 I just received the newest release, I'm Free, from Jordan Officer and it's terrific! Opening with At Least I've Got The Blues, a cool walking, Thrill Is Gone like track, Officer talks his lyrics, not unlike one of my all time favorites, Roy Buchanan, and lets his guitar do the talking. His guitar knows exactly what to do with beautiful tone and unquestionable phrasing. Excellent! A Night Of Fun, is up next with a carnival kind of feel. Tony Mason on drums and Jeff Hill on bass balance out this track. With a cool light jazzy touch this is a bright player. Title track, I'm Free, is a nice slow T-Bone Walker style track with beautifully articulate guitar work. Charley Drayton on drums and Andy Hess just sit tight in the pocket as Officer shows how it is done. Brilliant! When We Were Just Two is a cool retro track with a Bo Diddley beat. Loose guitar work and rhythmic backing make this a cool track. I'm All Alone had a cool Roy Head like vamp with a minimalist backing allowing the guitar riffs to breathe easy. Stylistic rather than pyrotechnics rule this track. Very nice! Jackie's Tune is a slow bluesy instrumental. This track really has feeling with well thought out riffs and runs. Although not the most dynamic track on the release, it may be my favorite just due to it's overall mastery. Excellent! Two Will Do is a bebop track featuring Officer and Mason on a tight jam. Officer does sing a few bars but it's the slick fretboard mastery that really makes this track hum! Life Just Showed Me is exclusively electric guitar and vocal. A simply strong track with solid vocals and rich blues riffs. On classic, Ain't Nobody's Business, Officer slows it down a bit and does some of his best stylized vocals on the release. His masterful guitar accompaniment along with the drumming of Tony Mason show a true appreciation for the original track and also his personal interpretation of a well known classic. Very nice! Wrapping the release is one of those western tracks that I always look for. Hang 'Em High sticks rhythmically to a western line but Officer gives it a real modern bluesy spin. I like his spontaneity and insight. This is a truly unique release and one I feel deserves strong recognition.